The election is now finally and positively and definitively over! The last counts in Wicklow and Laois Offaly and Galway West have been completed and the shape of the next Dáil is now known. Acres of newsprint have been used to analyse the results and hours of television and radio, of tweets and blogs have reported on every twist and turn of what was a hugely important election. Fianna Fáil and the Green Party have been punished for the bad decisions they took in government. Fine Gael and Labour benefited from the public anger. They did so despite having said they will implement Fianna Fail’s policy of adding private banking debt to the sovereign debt, and of implementing a succession of punitive austerity budgets over the next three years at least. There are a plethora of independents from the left to the right and many in between. And there are 14 Sinn Fein Teachtaí Dála! The largest number of Sinn Féin TDs in Leinster House since partition. As a result of this election 220,660 or 10% of the electorate in the south voted Sinn Féin. Together with the votes Sinn Féin secured in the north it means that in the last 12 months 392,633 people have voted across the 32 counties for Sinn Féin. That makes this party the third largest on the island. The final count which saw Brian Stanley take that final 14th seat fittingly concluded on March 1st the 30th anniversary of the commencement by Bobby Sands of the 1981 hunger strike. The hunger strike shaped the course of Irish politics in the subsequent decades. The success of Bobby’s election in Fermanagh South Tyrone in the Westminster election of April 81, and of Ciaran Doherty in Cavan Monaghan and Paddy Agnew in Louth in the June 81 general election in the south, were watershed moments. None of us knew that at the time. Some of us felt it instinctively but it has needed the intervening decades to understand the extent to which the courage and sacrifice of the ten men who died on hunger strike changed modern Irish history. For Sinn Féin it was the acceleration of a process of internal debate which saw the party embrace electoralism. And it was the commencement of a conversation which ultimately led to the party’s peace strategy and the peace process. In the south it was the end of majority government by a single party. From 1981 coalition government was the order of the day with a succession of parties, including Labour, the PDs and the Greens stepping forward to put Fianna Fáil or Fine Gael into government. And all paid an electoral price. It was also the beginning of the slow decline of Fianna Fáil as the dominant political force in that part of the island. Aside from the 14 who were elected this weekend there were others who did well have laid a good foundation for the future. Some candidates missed by handfuls. John Brady, Katherine and Eoin. The political strategy to achieve our republican goals is not an easy one. The process is inevitably slow and incremental, it has its up and downs, but it is working. Our task in the time ahead is to build on the gains that have been made. It means building on the all-Ireland dimension, the institutions, agencies and structures created by the Good Friday Agreement. Sinn Féin will be a constructive opposition. That means campaigning on issues that oppress working families from the universal social charge to cuts in health and education, to defending jobs. It means knowing who we are and what we represent. Opposing a bad government in Dublin while governing effectively in the north. Sinn Féin is an Irish republican party. We are in the business of achieving a United Ireland. A new republic, based on the principles and values contained in the 1916 Proclamation and the Programme of the First Dáil. Republicans are about building a new Ireland which embraces men and women, those of every religion and none, those who are orange and those who are green and those who have come to our shores in recent times. We seek a new Ireland built on genuine republican values of equality and fairness. We are not rhetorical republicans. We don’t just sing or dream or make fine speeches about a united Ireland – though all of these are important and have their place in that enterprise – we are the doers, the activists, the strategists and planners. We are the people who believe in citizenship and citizens rights and who understand that a real republic must look after every member of society – not just elites and the rich and powerful. To achieve these goals republicans have to build political strength and then use that strength wisely and appropriately. In the north Sinn Féin is the largest party in terms of votes and the second largest in terms of seats in the Assembly. In the south there is now a strong cadre of political activists about to enter Leinster House and a strong and growing Sinn Féin organisation across the state. Everything these elected representatives do, at Stormont or Leinster House, in local councils or the European Parliament and in communities must be about advancing our united Ireland project while defending peoples rights and improving the quality of life for citizens. In the last weeks of the election campaign hundreds of emails flooded our offices from people wanting to join Sinn Féin. The republican strategy is taking shape. Republican politics are changing Ireland. Republican politics are working. As we approach the 100th anniversary of the 1916 Rising there is hope that this generation of republicans can bring about a democratic revolution and achieve the objectives set out for us almost 95 years ago on Easter Monday 1916. Join us in that historic endeavour. 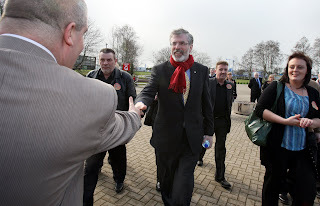 Must say Gerry congratulations on a successful election for you and of course your Party. Thank you a million for your blog! From Switzerland, my home country but Ireland is the country of my heart, I would like to congratulate you and all the Sinn Féin's TD's in this 31th Dáil! 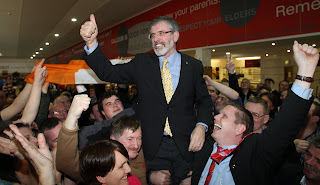 Your analysis is so right and it's fantastic to find again a strong Sinn Féin in the south with 14 seats! It's very particular because of all these events at the same time. General elections in the south, future elections to come in the north and today we all commemorate the beginning of the hunger strike of our dear Bobby Sands. Today I have a very deep and emotional thoughts for him and for his nine companions through their fight in 1981 against british imperialism. A wonderful time to be a Sinn Féin Republican and a great tribute to the Bobby Sands of the 1981. The hugely deep voice of Sinn Féin will now be clear in government. A hunger strike shaped the course of Irish politics in 1981 ,so has Gerry Adams and Sinn Féin. The Dáil can be a many-headed monster,as political legacy of the Uprising. The Great Depression created a crisis of traditional culture as well as politics and Counter-Hegemonic Struggles. This is a ture victory,millions of ordinary working people and begin to create an alternative vision of society. Very good DEPUTY ADAMS. You have always inspired me. PLEASE KEEP UP THE GOOD WORK.